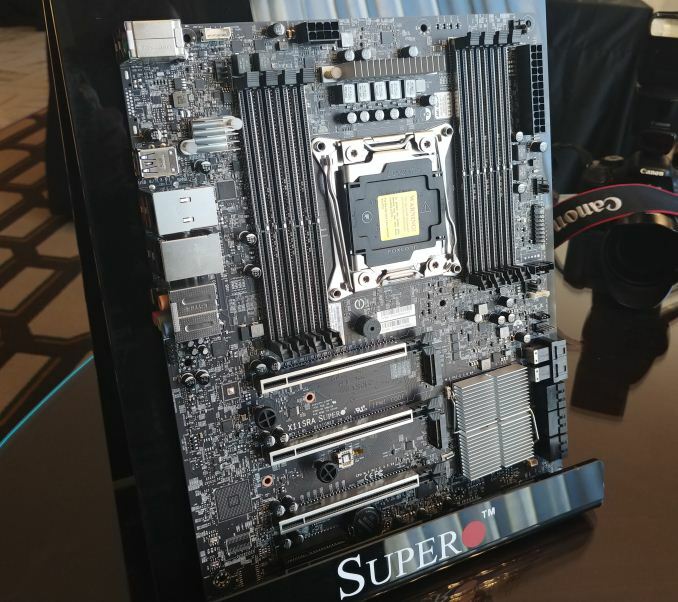 Another product on display over at Supermicro at this year’s CES was that of a Xeon W motherboard. Xeon W is Intel’s professional platform that is almost a copy/paste of the high-end desktop X299 platform, but uses a professional grade chipset and offers support for ECC and RDIMM memory. Like Skylake-X, the Xeon W platform supports up to 18-core CPUs (Xeon W-2195), with almost the same specifications, except for support up to 512GB of DRAM. In previous years, these two families of products were served by a single platform, but recently Intel has seen fit to separate them. As a result, we are seeing fewer and fewer professional-grade motherboards hitting the open market, leaving most sales in the hands of pre-built OEMs. 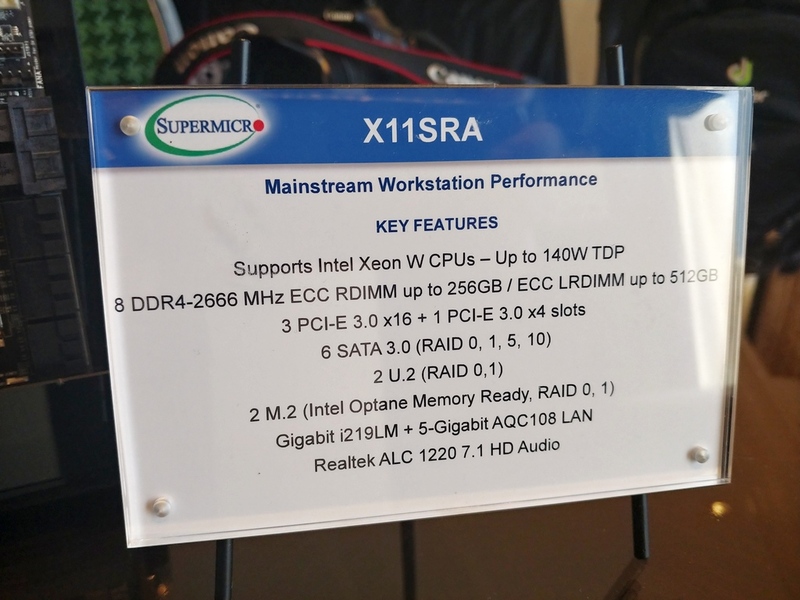 With Supermicro being one of those OEMs but with a consumer line, they are planning to offer at least one consumer/professional motherboard for this market, and that is the X11SRA we saw in the booth. If we look at the X11SRA, we can see a lot of similarities with the consumer X299 motherboards from Supermicro. Features like the dual U.2 ports from the C9X299-PG300 are here, along with reinforced DRAM slots and reinforced PCIe slots. The layout with dual M.2 drives seems to be a copy paste too, and there are a couple of unused pads on the bottom left which would normally be occupied by an Aspeed AST2500 management chip with some memory, as seen on the X299-PGF. With these pads present, there is likely to be an ‘X11SRA-F’ version alongside this board in due course. This X11SRA at the booth, we were told, was not a final version. The chipset and power delivery heatsinks still need to be finalized, and it would seem that there is an additional heatsink to the left of the DRAM slots near the rear IO for something (multi-gigabit Ethernet?). Visually, it is plainly obvious that the two sets of DRAM slots are at different heights on the motherboard – this would normally be jarring for a consumer motherboard, but for professional builds, it does not matter too much. The CPU power delivery shows only a 5-phase solution, which on a consumer motherboard would be dreadfully low. 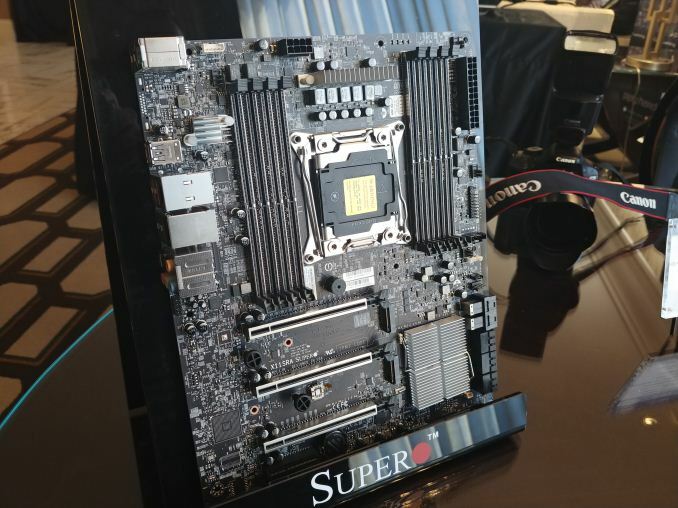 Xeon W processors are not designed to support overclocking, so Supermicro can make their motherboards to fit just within specifications and warranty. It’s worth noting that the spec list for the board states it supports only up to 165W, which is the 18-core Xeon W-2195, rather than Supermicro’s PG300 board that stated up to 300W. Other features on the board includes a Realtek ALC1220 codec, which is a surprisingly high-end choice for a professional motherboard, however it does not feature much in the way of advanced filtering or PCB separation that we see on consumer motherboards. Internet connectivity comes via an Intel I219-LM gigabit Ethernet controller, and Aquantia’s AQC108 5-gigabit network controller. USB 3.1 (10 Gbps) seems to be supported through two Type-A ports on the rear panel. As the X11SRA is still a work in progress, the release date is still TBD. First, the heatsink near the rear I/O is for the AQC108 listed in the spec sheet.